We upgraded from TFS 2013 on premise to TFS 2015 on premise. After upgrade, with initial verification we found one issue. After upgrade, if any user executes Test Run for any Test Cases, then the "Completed Date" for Test Run is shown with UTC timezone and not with the specific user's timezone. As shown in below image, a test run was executed on 5/18/2016 3:04:40 AM in EST timezone. But TFS shows 5/18/2016 7:04:10 AM as Completed Date. Here, TFS considers time stamp with UTC timezone instead of considering user's timezone. Initially, we thought this to be some configuration issue. 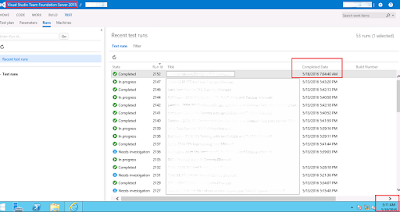 But after analysis and troubleshooting, we identified that, this was a bug in initial release of TFS 2015. 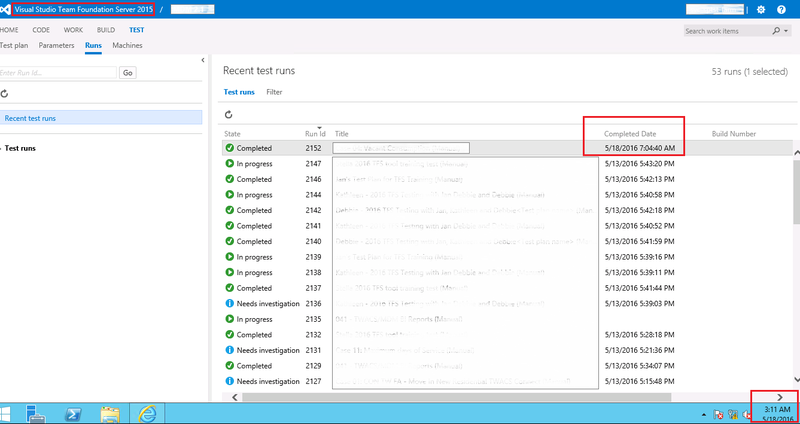 This issue has been addressed by Microsoft in TFS 2015 Update 1 and higher. To conclude, installing TFS 2015 Update 1 and higher on TFS Server will resolve this issue and users will be able to see Test Run execution "Completed Date" with user's local timezone.